1. The team’s biggest offensive threat – BY A COUNTRY MILE – is Big Al Jefferson. How do I know this? Because every time he gets the ball close to his kill spots (low block) the opposing defense bails on the other four guys to collapse on him. They know he’s a legitimate threat to score the ball on every posession. The message is obvious: stop Jefferson and let one of their other guys beat you. 2. The easiest way to punish a defense for triple teaming your best guy is to punish them with open three point shooters. The problem is, as it was last year, Charlotte doesn’t have those types of shooters. Y’know, quick release, dead-eyed long ballers who don’t need to dribble ten times or execute a couple of head fakes before launching a (by now) contested shot. 3. The few guys the Hornets do have who can shoot deep and quick are turnstiles on defense. A lineup of Big Al, Marvin Williams, P.J. Hairston, Gary Neal and Brian Roberts could cure the spacing issues in an instant but then give up a billion points at the other end. 4. After ascending into the league’s Top 10 defenses last season, Steve Clifford’s squad has slipped back into the Bottom 10 thus far this season. The team’s best defensive center, Bismack Biyombo, is barely functional on offense outside of a new-found dive game. The best wing defenders have either been injured (Michael Kidd-Gilchrist) or suspended (Jeff Taylor) and while Taylor has shown promise as a ‘three and D’ guy, neither he nor MKG could be mistaken for an offensive terror. 6. Stephenson has been an all around disaster. As a shooter, he’s 7-42 from beyond the arc (16.7%) and 32.7% from outside the paint. Keep in mind that the guy he was supposed to be an upgrade from (Gerald Henderson – never confused with Kyle Korver) has gone 30% and 46% from those same spots. Also, Lance may put up a beefy stat line but most of his rebounds are of the “gimme” variety – defensive boards grabbed out of the hands of a teammate with nary an opponent in sight. “Born Ready’s” 5.4 assists per game come at the price of 2.6 (often egregious and unnecessary) turnovers per and any on-ball defensive benefits are easily out-weighed by his loss of focus off the ball. In short, Lance is good at things the Hornets don’t need and he’s bad at all the things the Hornets do need. The obvious conclusion is to either trade Lance – who is still young, talented and on a no-risk value contract – OR trade peripheral pieces plus an asset or two (2015 1st Round pick, Noah Vonleh, Zeller) for a two-way, tough-defending three point threats. The problem is that shooting is extremely valuable in today’s NBA. And guy’s who can make you pay from deep while hounding their man at the other end don’t grow on trees. Take a look at the bottom of the Eastern Conference standings: Orlando, Boston, New York, Indiana, Charlotte, Detroit and Philly. Aside from the Knicks and the surprising Magic, every single one of those squads rank in the bottom third of the league’s top distance shooting teams (Charlotte ranks 29th). The entire league is on the lookout for the same guys which explains why Klay Thompson is a max player and why Danny Green may get eight figures per next summer. This is where Cho’s magical ability to find Bargain Bin Ballers needs to come into play. Finding the next Chris-Douglas Roberts, Anthony Tolliver, McRoberts, etc – is the best way to shore up the team’s weaknesses without mortgaging any of the future. Obviously, the team made a huge mistake not re-signing McRoberts in the first place and while I’d love to see the team make a move to bring him back from Miami, Heat President Pat Riley has absolutely ZERO incentive to empower a division rival. My guess is that they would only trade McRoberts in a package for either Zeller, Vonleh or a first rounder. That’s a tremendously steep price for a guy you could’ve just re-signed five months ago. The Knicks are a natural landing spot for Lance but what do they have to trade back? Tim Hardaway has a fantastic stroke but would add yet another one-way player to the Hornets’ roster. Iman Shumpert is likely a downgrade from Gerald Henderson. 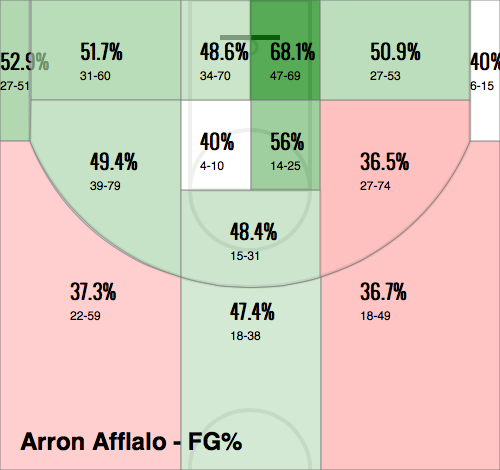 The Nuggets could be convinced of Lance/Arron Afflalo swap. Something like that is the best case scenario if the organization wants to steer clear of the asset carpet-bombing days of Larry Brown and Rod Higgins. That previous era’s lack of patience and long-term roster construction lies at the heart of the Charlotte’s current crisis: Ensure competitiveness in the re-brand year or take the PR hit today and keeping adding assets. It’s a huge question that doesn’t have an obvious answer. One good, costly trade could elevate the team today and push them into the thick of the East’s Playoff picture come April. The city would buzz and the Hornets would be relevant. But if that kind of trade were to backfire…well, all I can say is Google the phrase “2011 Bobcats”. The Bobcats-era wrapped up with an emphatic BANG of a season that saw the team improve by more wins (22) than it won in total the season prior (21). Instead of trotting out a bunch of could-be’s and haven’t-beens to theoretically improve their draft position, Charlotte’s NBA franchise bucked the NBA’s current trend of tanking and revitalized a downtrodden fan-base in turn. Basketball is again something worth talking about in the QC and thanks to Coach Clifford & Company, the excitement won’t just be about a new coat of teal & purple paint. I often found myself in the role of Lone Hendo Defender throughout much of the season. Having watched his development over the past five years – from a quarantined rook at the end of Larry Brown’s bench to a quality two-way NBA starting two guard – I was excited to see what Gerald could become on a good team. The answer was a resounding “passable“, a sometimes scoring, sometimes attacking, sometimes lockdown defensive shooting guard whose poor man’s D-Wade game just doesn’t work all that well on a team desperate for long range shooting. Like most of the Bobcats’ opponents this season, Miami smartly packed the paint and crowded Kemba Walker at the point of attack – knowing that the inevitable ball swing to the open shooter wouldn’t hurt them. That’s a problem. Henderson doesn’t want to shoot off the catch at all – he’ll be wide open and hesitate before taking a bounce or faking a pass only to throw up a clanker out of necessity. His mid-post and iso games were made redundant once Jefferson was added to the mix and Hendo wasn’t able to transition his game over the course of the season to compensate. I like Gerald and think he gets an unnecessary bad rap from the fans but it’s obvious that he’s a bad fit on a Kemba/Big Al centered offense. The good news for Charlotte is that there are a few options to remedy the issue either in the draft, free agency or via trade. With Portland’s 24th overall selection, the Hornets will likely have a shot at former Tar Heel P.J. Hairston (controversial, high upside), Duke’s Rodney Hood (safe, lower upside) or the UCLA SG prospects Jordan Adams (good mechanics, iffy results) and Zach LaVine (skinny and raw). None of these guys will step in and be instant All-Stars but could provide a nice boost in the limited role of floor-spacer. Free Agency offers a couple of high priced young vets in Lance Stephenson (combustible, questionable fit) and Gordon Hayward. Hayward is probably the team’s ideal target as a sweet shooting, shot-creating big wing but he’s a restricted free agent that Utah says they want to keep and there’s rumored to be a long line of suitors should the Jazz change their minds. One cheaper, under the radar alternative might be OKC’s Thabo Sefolosha. While Thabo’s not a shot creator like Lance or Hayward, he’s been a fantastic “three and D” knockdown guy for many years and shouldn’t cost the team more than $4 million or so per season. Although Sefolosha struggled with his stroke this season, he shot 40%+ from downtown in the previous two. Perhaps most importantly, Thabo won’t kill Clifford’s defense while he’s out there. 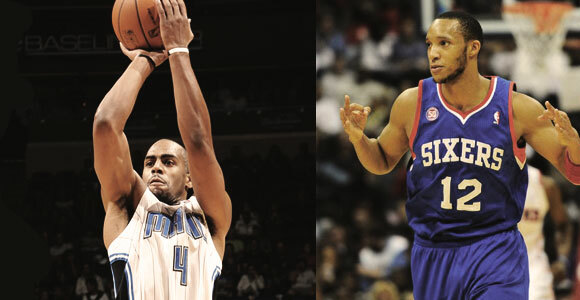 On the trade front, Charlotte’s has already been linked to Orlando’s Arron Afflalo (42% 3PTFG) via ESPN’s Mark Stein. Afflalo’s nearly thirty and only has one more guaranteed season on his deal – so don’t expect GM Rich Cho to give up much (maybe a couple of 2nd Round Picks) for Arron’s services – but putting Afflalo in teal & purple could provide an immediate upgrade for Charlotte’s distance shooting without having to break the bank short-term. In an unexpected karmic re-balancing, Josh McRoberts has provided the answer to a long asked QC Hoops question: “What if Boris Diaw gave a damn?“ Unlike the bovine Segway Surfer, Josh brings maximum effort every game and is beloved by both teammates and fans alike for his abilities as a floor-spacer and distributor. One of the most unique players in the league, McRoberts functions often as the team’s spot-up shooting point guard in the half court, rarely creating for himself. Outside of Kevin Love, there probably isn’t a better fit for Charlotte’s offense with Kemba Walker still progressing as a traditional point and Al Jefferson desperate for floor spacing. Retaining McRoberts, who will likely opt out of his two-year deal he signed last summer, is of tremendous importance. With an expected cap increase coming for all teams, expect Josh to command around $5-$6 million per season on the open market. Ramon Sessions had his flaws: He was guilty of tunnel vision, he wasn’t a reliable three point shooter and he was a less than stellar perimeter defender. But he was light years less destructive for Charlotte than his trade deadline replacement, Luke Ridnour. While Luke’s abilities as a traditional floor leader came in handy, he proved to a be a fantastically bad shooter (39%FG, 30%3PTFG) who couldn’t draw fouls and was a gi-normous liability on defense. Fans complained when Ramon’s second unit minutes became a constant barrage of head down drives. But at least “Sesh” turned those drives into trips to the line, easy layups or – at worst – short rebounds. Luke’s second units often devolved into hot potato on the perimeter until the shot clock forced a bad three or a Luke giveaway. Fortunately, both Ridnour’s and Sessions’ deals expire this summer and Ramon has let it be known that he’d like to be back. That would be a-ok with me and it’s likely that some of his former detractors would welcome Sessions back with open arms after having been subjected to Ridnour for a few months. Charlotte could also hit the trade or free agent markets looking for a fit. If Jameer Nelson gets bought out by Orlando (likely), Clifford would surely love to have him backing up and mentoring his height-challenged PG of the future. Philly’s Tony Wroten has his warts but offers an intriguing combination of size and potential – he likely doesn’t fit into the Sixers’ future plans with Michael Carter-Williams on the roster so could be made available for the right price. Unrestricted free agent options includes guys like Greivis Vaquez, Rodney Stuckey and Mario Chalmers. Chalmers in particular would be an interesting signing as a spot up shooting, high-end backup whose acquisition would simultaneously weaken a division opponent. The Bobcats have $6 million committed to the Bismack Biyombo and Brendan Haywood combo next season and neither is an ideal backup for Big Al. Biz is a complete non-factor on offense as well as a turnover machine and Haywood can’t even get on the court, having missed the entire ’13-’14 season with a foot injury. In an ideal world, the Hornets could find a rebuilding team to take on Biz’s upcoming $3.8 million salary in a straight dump and use the space created either via free agency or trade to bring in a veteran two-way replacement. One outside-the-box free agent pick is PHX’s Channing Frye – a legit “stretch five” 6’11” guy who can nail threes (37% 3PTFG on 5.3 attempts per game). Bringing Frye in with the second unit could open up the paint for more drive opportunities for guys like Gary Neal and allow MKG an opportunity to work in the post. Regardless of who they end up with, Charlotte will need to figure out how to get Big Al some rest – he played 35 minutes a night for Clifford this season and is nursing a ruptured plantar fasciitis. Given his age (29) and body type, Jefferson would be better off decreasing his minutes down closer to the 30 per game mark. For that to happen, Cho will need to find a capable backup. The Hornets can’t solely depend on outside help if they want to get better, their recent Draft picks have to grow as well. Kemba Walker should spend the entire offseason working on his shot. As much as we love Kemba, 39% from the field just isn’t going to cut it. There were many nights this season where Walker’s 6-18 or 4-16 shooting actively hurt the team. 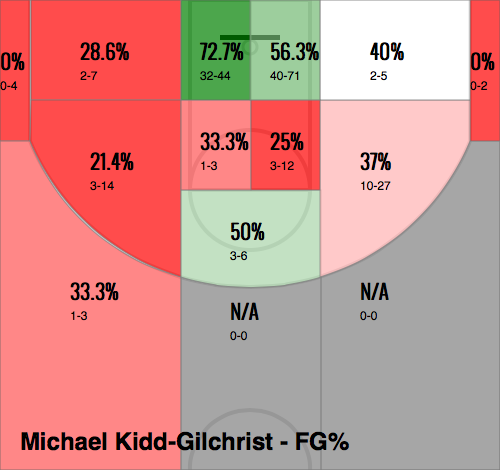 Conversely, Michael Kidd-Gilchrist might want to shy away from rebuilding a fundamentally broken shot and spend more time on developing a post-up game and maybe even add a floater or hook to his repertoire. Those skills could pay instant dividends, especially if the front office can add shooting around him. Cody Zeller has voiced his concern about adding bulk, saying that it might hamper his speed and leaping ability. Fortunately, it’s 2014 and there are ways to add core, functional strength without bulking up too much. 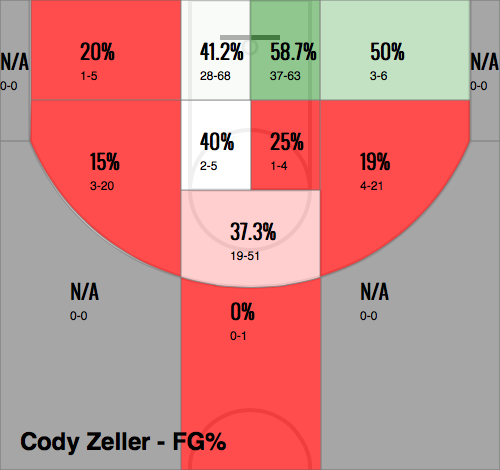 Cody needs to divide his time between strength training and the mid-range jumper all summer. Jeff Taylor is a complete unknown at this point. He’s nearing 25 years of age and rehabbing a torn achilles. His shot was ok in theory pre-injury but produced horrific results in practice. He seems like a great young guy and we’re hoping for a full recovery for JT down the road but expectations should be kept at a minimum. Coach Clifford somehow turned Charlotte into a Top 10 defense in his first season and has said on multiple occasions that he’s just getting started implementing his advanced scheme. Since you can’t add systematic nuance with a complete roster overhaul, expect much of the Hornets core roster to remain the same. Upgrading the shooting guard position, retaining McRoberts, finding suitable backups for Big Al & Kemba and continuing the youngsters’ development internally will only vault the Hornets higher into the Eastern Conference. Speaking of which, some have questioned if Charlotte has enough core talent on hand to compete for anything beyond a Playoff seed and those people are sort of missing the point. In the modern history of the NBA, no franchise has ever gone from perpetual doormat to champ and perpetual doormat is exactly what the Bobcats were for nearly all of their ten year history. Michael Jordan, Cho and Clifford are building a culture of competent, competitive basketball. 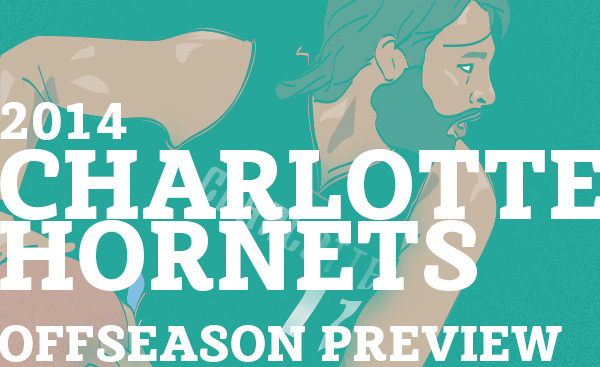 It may lead to legitimate title contention and it may not but for the first time in forever, Charlotte’s hoops franchise is worth the blood, sweat and tears of a fan’s investment. They will play hard, they will play smart and, for the first time in ages, they will make you proud to let the world know where your allegiance lies. Editor’s Note: It’s been a while since the last Week In Review post and – given our contributors’ schedules and life commitments – we don’t anticipate them returning any time soon. We’ll post as often as we can. In the meantime, if you are an obsessed Bobcats/Hornets fan with thoughtful, unique perspectives and would like to share them on this site, hit us up on Twitter – @BaselineBuzz. TRADE: Bobcats send Ben Gordon and Portland’s 2014 1st Round pick to the Sixers in return for Evan Turner. Charlotte sends Bismack Biyombo to Boston for Brandon Bass. We’ve been reading about the Bobcats’ interest in these two players for weeks. At first glance, the rumors are little confusing: While Brandon Bass makes sense as a pick ‘n pop backup PF, Evan Turner doesn’t remedy Charlotte’s spacing issues at the wing and the soon to be restricted free agent will likely get pricey once agent David Falk strongarms Cho & Co in negotiations over the summer. So why would Charlotte trade a late first round pick for him? For one, even with his three point shooting woes, Turner represents a massive offensive upgrade over Michael Kidd-Gilchrist. 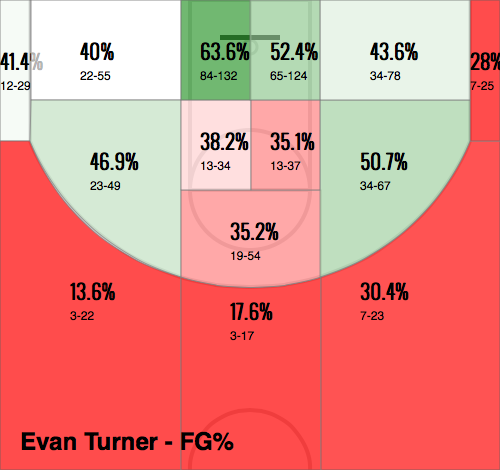 While an overall poor distance shooter (28% for his career), Turner has traditionally shot well from the corners. This season he’s specifically shot well from the left one (12-29) and we all know who likes to camp out down on the left block. A combined 19-54 from both corners doesn’t sound like much until you compare him with the guy he’d likely be stealing minutes from. MKG is a combined 1-9 from the corners over his one and a half NBA seasons. I triple checked those numbers just to make sure. One for nine. With a once in a generation low post scorer like Al Jefferson on the roster, it’s borderline irresponsible to play a non-distance threat like MKG alongside him – and by distance I’m not even talking three pointers. MKG is currently 20-59 on two pointers outside of the paint after going 59-202 (29%) during his rookie campaign. Turner’s 43% mark from long two’s (his average both this season and last) will make Al think he’s playing with Steph Curry by comparison. On the other side of the ball, Turner’s presence allows Coach Clifford to stay big at the wings when MKG or Gerald Henderson go to the bench. Clifford’s recent rotation has been to play both point guards, Kemba Walker and Ramon Sessions for the last chunk of the first and third quarters. Bringing Turner and Bass in for Henderson and McRoberts as a combined “Sixth Man” mid-way through the first allows Clifford to maintain the needed perimeter size to protect Big Al on defense while replacing McBob’s “point forward” abilities with Turner’s – who, until this season, had maintained an assist rate in the high teens. Trading Gordon’s $13 million plus salary to the cap-rich Sixers allows Charlotte the added benefit of opening up around $6 million in additional salary space to take on money in a Biyombo for Bass swap. Bass makes roughly double what Biz is owed this season and the Cats would be buying that wiggle room as well as Turner’s services in exchange for Portland’s first rounder. 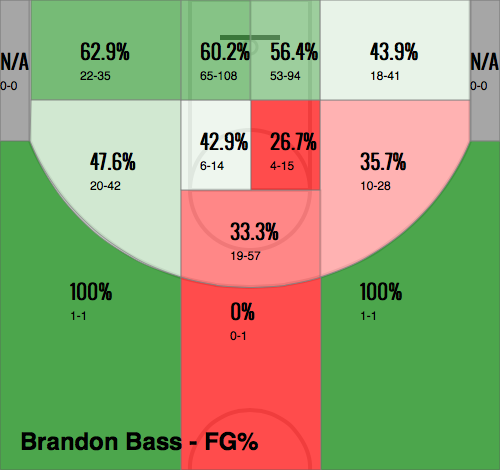 On the court, Bass would be an immediate upgrade over Cody Zeller – whose future is a lot brighter than his dreary present. Bass has logged campaigns as a burly rebounder and defender while playing under Stan Van Gundy in Orlando (on a staff that included both Clifford and Patrick Ewing). His defensive effort hasn’t been as consistent since but the Cats would be betting on Clifford reversing the trend. Offensively, Bass would nail all of those mid-range shots Cody is currently missing and further help stretch the floor once McRoberts checks out. Long term, Bass is only signed for one more season and would provide a safety net should Josh exercise his player option and bolt for greener pastures in July. By the time Bass’s contract expires, either Cody will be ready to start or Charlotte could use the funds to go another direction entirely. Trading Biyombo stings a bit. While he occasionally flashes potential, #biznation is still years away from putting it all together (if it ever happens at all). At $4 million next season, Biyombo is simply too pricey a project for a team already straddled with a similarly raw MKG and his $11 million over the next two seasons. TRADE: Bobcats send Ben Gordon and Detroit’s Protected 1st Round Pick to Orlando for Arron Afflalo and Glen Davis. 1. The Detroit pick is MUCH more valuable than the Portland first. Should the Pistons fall into the Bottom Eight this June, they’d keep it and the pick rolls over to next season where it is only Top 2 protected. Given the state of the Pistons franchise, anything is possible. At the very least, Charlotte would be trading a young prospect like Gary Harris or Doug McDermott in this June’s Draft for the immediate upgrade of Afflalo. 2. The good news is that Afflalo is a tremendous three point shooting wing and potentially the PERFECT fit for this team. Arron has traditionally been a better wing defender than Turner and is a much better off the ball scorer. Afflalo probably should’ve been selected to the All-Star game ahead of Joe Johnson this year but the Magic’s lousy record kept him out. Also his contract runs for another season, so no need for immediate negotiations over the summer. The downside is that Afflalo is already 28 and wings usually don’t get better as they hit 30. Adding Afflalo virtually guarantees a Playoff spot for Charlotte both this season and next but could cost them an intriguing prospect should the Detroit pick fall in the right spot. It’s a textbook win-now versus win-later scenario – muddied further by the Bobcats historical inability to draft well. *One additional exception: Glen Davis is approximately 70% as good as Bass offensively and around 60% defensively. Those numbers are approximate and yes, I am no fan of Big Baby Basketball.